Rosh Hashanah meals in my Nana Harriet’s house near Boston are some of my most memorable childhood experiences, and most likely the core reason I pursued a career in food as an adult. Those first bites of the great Ashkenazi staples—matzah balls, brisket smothered with sweet and sour tomato sauce, tzimmes and kishke—were what got me hooked for life. But now I am an adult living far from my small hometown in New Hampshire. For the last 11 years, Israel has been my home. It is the land where I met and married my husband, Eli, and where we welcomed our three sons—Lev, 5; Gidi, 3; and Chemi, 1. My children are now the hungry youngsters waiting impatiently at the holiday table. My messy little boys with wrinkled-up noses and borscht-stained smiles are a culmination of me (an American Askenazi Jew) and my husband (a Jew from the former Soviet Union). Together, we have become Israelis, living in a land that beautifully succumbs to seasonal produce. We are a little bit Mediterranean mixed with the brightly spiced foods of the Middle East. 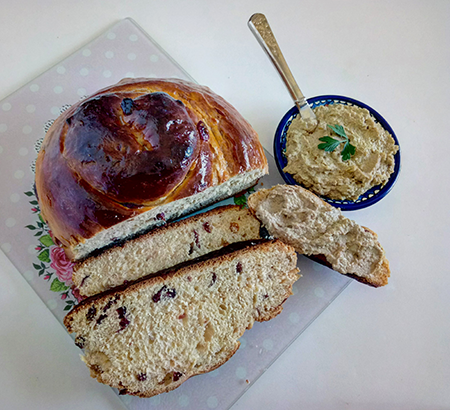 For year, I remained a creature of habit, feeding rich Eastern European foods to family and guests on the High Holidays, watching them sweat nervously while fanning themselves in the September Israeli heat. Steaming matzah ball soup simply does not work when you are schvitzing in severe late summer heat—and for that reason my husband’s Russian-Israeli family never grew up on the stuff. Slowly, I adjusted, allowing my holiday table to reflect my family’s Israeliness—but with decided input from my grandmother’s kitchen. My Rosh Hashanah menu this year features classics and contemporary recipes, but always with my own twist. 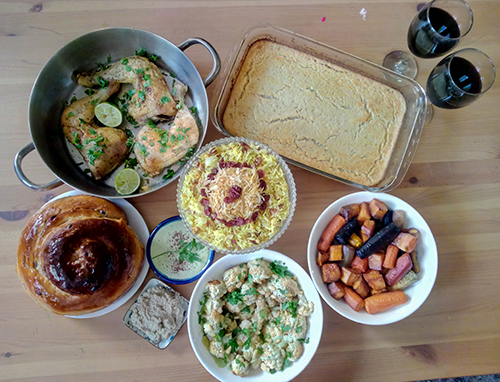 Along with Honey Raisin Challah, Mediterranean Roasted Chicken Thighs, Honey-Glazed Heirloom Carrots and Cauliflower Roasted with Green Tahini Sauce and Pine Nuts, I will be serving Chopped Liver with Caramelized Onions and White Wine, Jeweled Persian-Style Rice, Potato Kugel with Caramelized Onions and Honey Cake for a New Era. Influenced by the entire world and totally representative of the melting pots of America and Israel. This year, I will serve wine from Tulip Winery, a kosher label that produces several red varietals. Located in the Village of Hope (Kfar Tikvah), a cooperative that provides a safe and productive environment to mentally disabled adults, the Tulip combines expert winemaking with tikkun olam by employing a handful of the residents to help in the harvesting and bottling. With love and wishes for a chag sameach from Haifa, Israel! The highlight of every holiday meal as decided by possibly the only child in the world to ever eat chopped liver for breakfast. Blame my grandmother for sending me home as a kid with extra-large Pyrex containers filled with her perfect rendition of the classic. As the cook in my home now, I couldn’t resist adding a few of small touches; humble chopped liver brightened up with white wine and onions takes the dish to the next level of golden and sweet. Serves 6-8. 1. Prepare the hard boiled eggs and caramelized onions in advance (see cooking method under kugel recipe). 2. Remove connective membranes from raw chicken livers. Fry livers in a hot pan with the vegetable oil until just cooked though, about 4-5 minutes. Take care to not overcook the livers. 3. Drain excess fat from the livers, then transfer to a food processor. 4. Add hard boiled eggs, caramelized onions as well as salt, pepper and garlic, and pulse until the mixture comes together. 5. Slowly add the white wine, and pulse to the desired consistency. Before living in Israel I seldom ate rice. I come from a long line of potato eaters. It took years of practice for me to perfect making rice, but now that I have a preferred technique, it can easily be changed up according to mood and the additions one has on hand. This version is a festive one including sautéed dried cranberries, cashews and fried onions. Serves 10-12. 1. Place the rice in a fine mesh strainer and rinse under cold water until the water runs clear. Set aside. 2. Heat the 3 cups of water, then stir in the turmeric. Set aside. 3. Heat the oil in a large pot on medium high heat. Finely chop and sauté the onion in the oil. Add cashews and cranberries, continuing to sauté until the onion is translucent. 4. Pour the chicken stock into the pot and stir to break up any bits that might be stuck to the bottom. Let stock evaporate, then add the rinsed rice. 5. Sautée the entire mixture for one minute, then add the turmeric water to the pot. Give a quick stir to combine, then let the mixture come to a soft boil. 6. As soon as the mixture boils, cover the pot and turn the heat down to medium low. Cook for 13 minutes, then remove from direct heat. Allow the rice to continue to self steam for an additional 30 minutes. DO NOT REMOVE THE LID until 30 minutes have passed. 7. After the proper time, remove the lid, fluff the rice and adjust seasoning to taste. Representing my Polish heritage, a holiday cannot be celebrated without a potato kugel on my table. Caramelized onions give a nod to the original king of “spice” in the Ashkenazi kitchen. 1. Make the caramelized onions, reserving half for use in the chopped liver: Slice 3 onions into thin half rounds and sautée on medium high heat in 2-3 tablespoons oil until wilted and lightly golden. Reduce heat to medium low, stirring occasionally to prevent sticking, for about 10-15 minutes. Once lightly golden, when most of the natural liquid from the onions has evaporated, add chicken stock a bit at a time—up to 1 cup—to deglaze pan and keep onions from burning. Let the liquid evaporate before adding more little by little, continuing to stir. Do so until onions reach deep golden color, then set aside to cool. 2. Lightly grease two 9- x 13-inch pans and set aside. Preheat oven to 450. 3. Cut, peel and quarter potatoes into fourths. Do the same with the remaining 3 onions and place in a food processor. Add the eggs, oil and spices and blend until smooth. 4. Scrape down the sides of the food processor with a spatula, add flour in an even layer and cover with 1 cup room temperature chicken stock. Blend until smooth and incorporated. Add caramelized onions and pulse several times. 5. Pour mixture into prepared pans and bake for 20 minutes, until the top of the kugels becomes golden. Reduce heat to 350, cover with aluminum foil and continue cooking 40-45 minutes, until kugel is set in the middle. This honey cake recipe piggybacks off the ubiquitous magical honey cake that has circled the web for years. This version pushes the boundaries of flavor while retaining moistness and a surprisingly light texture. 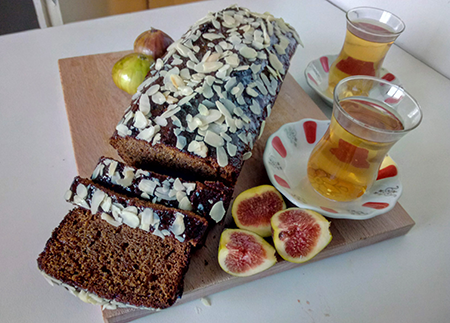 It is infused with freshly grated ginger and Earl Gray tea and is topped with warmed honey and toasted almond slices. 1. Preheat oven to 350. Prepare two 12-inch loaf pans by lightly brushing with oil, and lining the bottom and sides with parchment paper. 2. Whisk together the flour, baking powder and soda, salt, cinnamon, nutmeg and ground cloves in a medium bowl and set aside. 3. Combine honey, oil, sugars, vanilla and ginger in an electric mixer fitted with a paddle attachment and mix to combine. 4. Add eggs one at a time, mixing well between each addition. 5. Combine the cooled tea, orange juice and whisky in a medium bowl and set aside. 6. Add 1/3 of the flour mixture to the batter, mixing until combined, then add 1/3 of the liquids. Continue alternating dry and liquid, ending with the flour mixture. 7. Pour the batter evenly into prepared pans and bake for 55-60 minutes. 8. Once cooled, remove from pans, lightly brush with warmed honey and sprinkle with toasted almonds. Jessica Halfin is an American ola to Israel. She is a food and culture writer, pastry chef, gourmet cook and owner and operator of Haifa Street Food Tours. She resides in Haifa with her husband, Eli, and their three young children. It’s a shame the author of this article is unaware of Ashkenazi Jewish traditions. Nuts are to be avoided on Rosh Hashanah. She includes both cashews and nutmeg (e.g., egoz) in her recipes, which makes them inappropriate for this holiday. Nutmeg is a spice. Not a nut. I have seen a whole nutmeg, and while it may look like a nut, it is actually a seed. Look it up. Frank, very interesting comment! Like many things in Judaism, this is a minhag, not a prohibition. Many Orthodox Ashkenazi Jews I know consume all types of nuts on all of the chagim, including Rosh Hashanah! 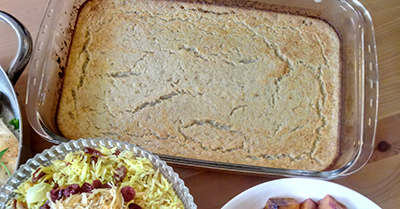 Always interesting to learn about more customs – including Jessica’s delicious recipes! As mentioned in the article, my menu represents many different cultures, and a distinct Israeli and Sephardic influence. If you follow Halachic Ashkenazi tradition, then these recipes will still be good with minor adjustments. 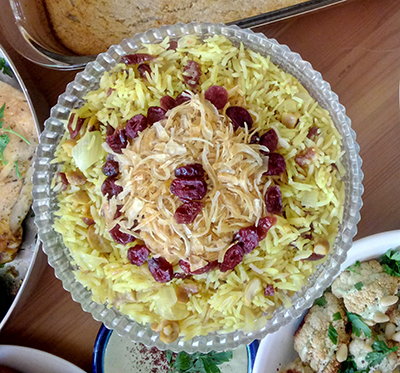 The nutmeg in the cake can be omitted, and the cashews in the rice dish can easily be replaced with almonds and produce just as delicious a result. Thank you for allowing me the opportunity to offer these substitutions, and wishing you a shana tova. oh my—- I come from 5 generations of American Ashkenazi, kosher keeping, Jews. I have never read or heard that nuts should not be used on Rosh Hashana. ( I have at least 2 big books on keeping kosher and not a word about this). What is the source of the “prohibition”? Thanks for reading and defending :). Chag sameach! Beautiful article with great recipes! I love the mix of old-world Ashkenazi food with more modern Israeli fare. Thank you for this fresh perspective on Rosh Hashana foods! What a beautifully written article, reflecting love of family and tradition. I await your next holiday menu. Thank you, Efrat! Wishing your family a chag sameach :). Thank you for these inspiring recipes. Some will certainly be a part of my menu. Regarding nuts, I had to look it up myself as well because I had never heard of the no-nut perspective. Here is a resource. Can you provide the recipe for the Mediterranean chicken thighs? If it is still relevant, they are slathered in good olive oil, and then sprinkled with salt, pepper, garlic powder, paprika, thyme, and turmeric, sprinkled with lemon or lime juice, and baked at 400 degrees Fahrenheit. Sprinkle with fresh chopped parsley once they come out of the oven. Hi Moderator – For some reason I kept screwing up – please delete the other two posts and post the text below – I need another cup of coffee! Nutmeg is a spice – not a nut. So not sure why Frank said to avoid them on Rosh Hashanah. Same with corn nuts. Not nuts. And coconuts. And, of course, the wonderful doughnut!